Public spaces that are for some people, for some of the time, will kill urbanity. Real cities have many open and unscripted places where otherness is encountered, and where non-consumers are also citizens. The result is a “filter bubble”: we rarely encounter anything that is outside our comfort zone, we only engage with people who share our worldview and we often end up simply being sold more stuff that we already have, all the while making sure that our behaviour fits the image that we want others to have of us. Different search results for different people make for cultural and intellectual isolation. 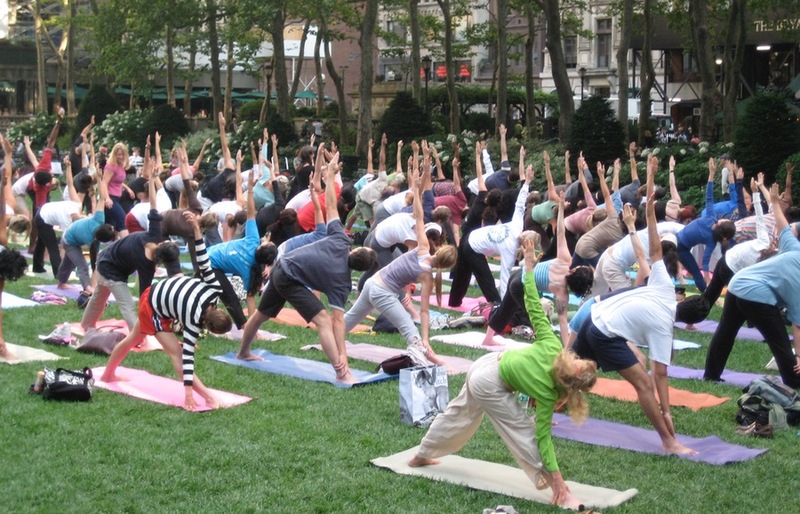 Public spaces in cities risk a similar destiny. Cities are becoming archipelagos of fragmented and isolated islands, separating different groups of people. The more wealthy parts are increasingly designed to death for reasons of security, efficiency and retail, while CCTV, police, private guards and mobile phone tracking systems keep a close eye on us. Because we don’t want to get in trouble or simply don’t have time for it, we all police ourselves and try to behave like middle class consumers. 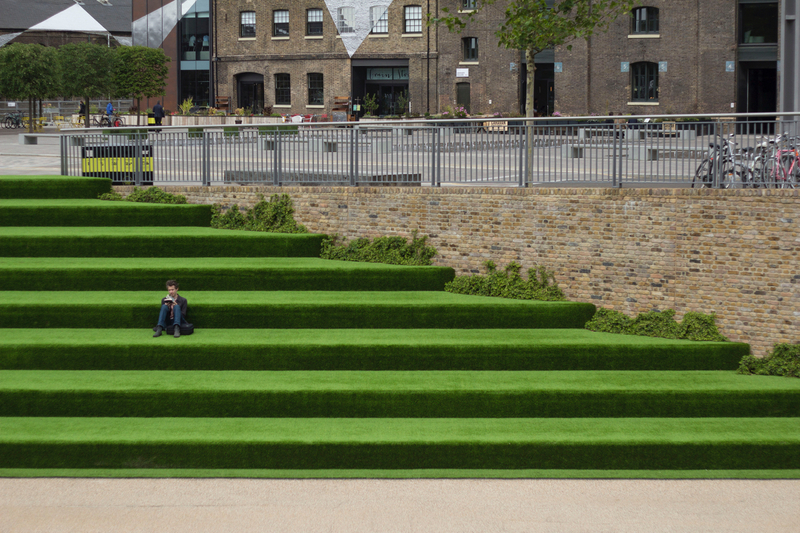 Limited in their diversity of people and functions, and closely controlled, public spaces increasingly minimise the potential for unexpected encounters and limit the range of possible uses. Surprise is also central to sociologist Richard Sennett’s ideal type of urbanity, encompassed in his term ‘porosity’. Porous places are incomplete, open to unscripted actions and unplanned functions. They evolve over time. Sponge-like, they can absorb diversity and provide opportunities for people to gather, do business or just hang about. For Sennett, Delhi’s Nehru Place, an intense, socially mixed and complex market is a dream example. IABR–2016 has several projects on show which revolve around public space. Flex Test ROC proposes to re-introduce vocational education to Amsterdam’s inner-city, in unconventional typologies that interact with other urban cultures, including schooling ‘to-go’ at train stations and flexible setups in underused buildings. It sounds like Hajer’s ‘innovation milieus’. The project Hong Kong In-Between highlights the vital public space in Hong Kong’s 150-km-long alley network, where micro businesses provide basic necessities, specialised goods and services, and employment opportunities for many of the city’s immigrants. This micro network, just as with Sennett’s Nehru Place, is highly flexible and adaptive. The celebrated dynamic in both places is also largely informal, context-specific and unplanned, which makes them impossible to duplicate. Moreover, such places are vulnerable, not least to real estate logic and ‘regeneration’. The challenge here is to preserve urban porosity, but how can you preserve something that is necessarily in flux? Another project in the exhibition that stands out – albeit not because it represents the most inspiring urban future – is Toronto’s King-Spadina neighbourhood, an area characterised by enormous real estate development pressure. At IABR–2016 the City of Toronto shows its struggle with developers who lie in wait, ready to fill every possible rent gap in the area, driving out affordable office space, housing, and cultural venues. Densely built King-Spadina has limited public space. 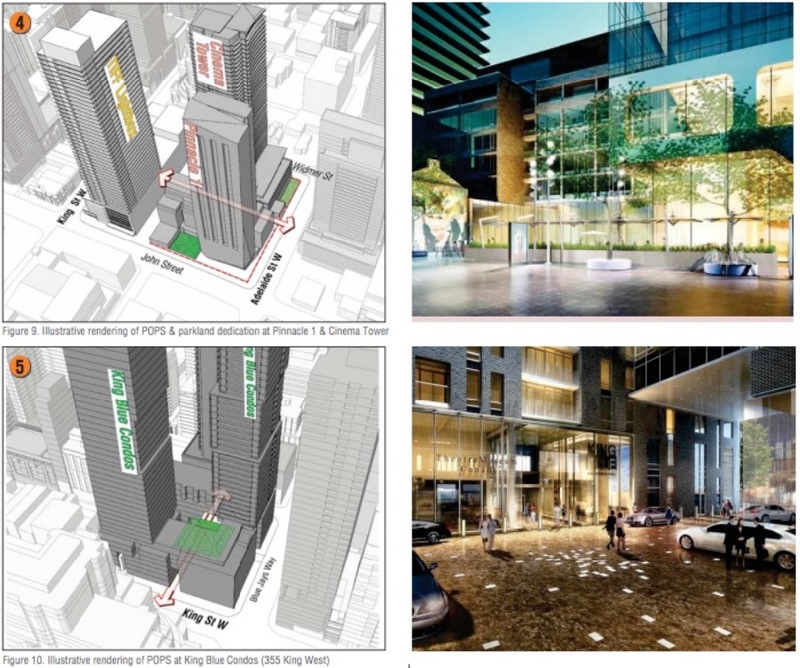 The solution the City of Toronto presents is to seduce real estate companies to create privately owned publicly-accessible spaces, or “POPS” in spatial code. The urban design guidelines document is cheerfully subtitled “Creative placemaking to enhance urban life”, but doesn’t incorporate existing criticism towards the use of POPS. While the document shows how developers and property owners can create courtyards, plazas, landscaped setbacks and other places on their property for people to take a break from the fast life in this successful part of town, it refrains from discussing who cities are for. “Creative placemaking to enhance urban life”: some of the proposed POPS in Toronto’s King-Spadina neighbourhood. “If you have control over who is on your property, that’s not public space,” says Bradley Garrett, human geographer at Southampton University. Garrett is also author of the book Explore Everything: Place-Hacking the City, and writes about POPS for the Guardian. Living in London, where public space is sold off to private companies at an increasing pace, he sees that POPS limit the potential range of activities in the city, because they set restrictions for their users. In many open spaces in London, private security guards keep watch because there are so many things you are not allowed to do: amongst other things photograph, congregate or protest (property owners are free to create any kind of limitation). Garrett thinks the main problem with POPS isn’t ownership, but the management and control of the spaces. “It’s not public space, because the space is for some of the public, some of the time, and those rights can be withdrawn at any time.” He argues that there should be legislative changes that say that such places have to be governed by the law of the land and not by the will of the property developer. All alone on the AstroTurf®. Granary Square, London. Hajer sees it differently. “It’s the same argument that [architect and writer] Michael Sorkin uses: if homeless people aren’t allowed in, it’s unjust. But does that always have to be the case?” He agrees with Garrett’s argument for having the same rules for actual public space apply to POPS. Garrett continues to oppose London’s privatisation. He founded the London Space Academy, which has a two-step battle plan. “First, it maps all of the public spaces in London and then codes them according to activities that can take place there. What this also does is that it raises awareness about what you can’t do in these spaces, because often that’s invisible.” The second step is testing spaces through Space Probes: interventions with which the security apparatus of urban spaces is tested and a community is built that “can mobilise to build a commons or at the least undertake placemaking.” The first of these space-reclaiming interventions recently took place in front of London’s City Hall. The open space is privately owned by a Kuwaiti property company since 2013, which means that you can’t protest in front of the city’s seat of government anymore. Amsterdam, 1967: authorities forcefully evict peaceful protesters from Dam Square. Garrett: “Ideally I would like a flood of people to go to Granary Square and tell the security guards to get bent. If they want to call the police and have the riot police remove everyone from privately owned public space – great, they should do that, that would be fantastic.” The approach is reminiscent of Provo. 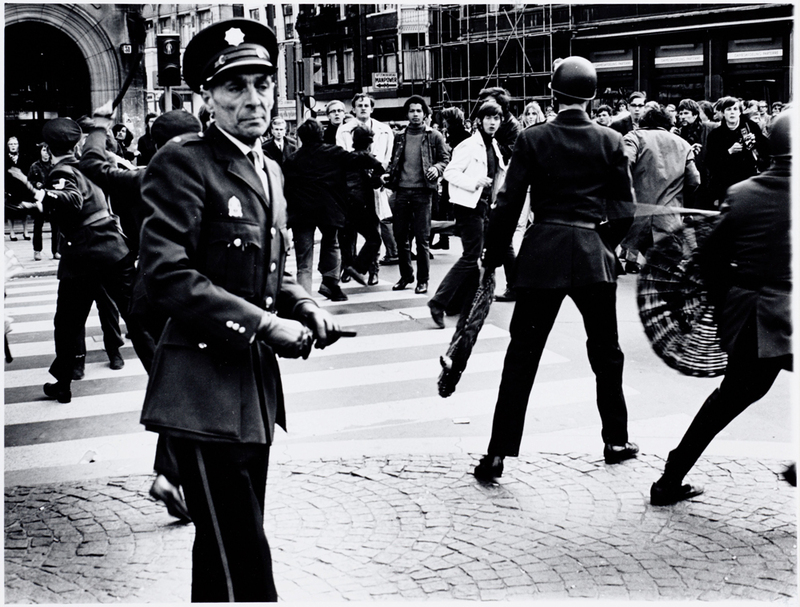 The 1960s counter movement provoked violent responses from authorities in Amsterdam using playful actions and interventions, in order to draw attention to their radical message. Following violent crackdowns, Provo mobilised public opinion and Holland’s hippy era took off. Will the current fight for urban space also gain momentum? We know that the commons will not make a comeback soon. But however spaces are owned, we can’t have exclusive private or political interests dictating public life. And we can’t let business sell us illusionary ideals of safety and order. Spaces that are for some of the public, for some of the time, are spatial filter bubbles: suburbanized, monocultural parts of the city devoid of urbanity. Real cities have lots of open places where people can casually meet, exchange, freely express themselves and develop a sense of belonging. Spaces where otherness is encountered and where non-consumers are also citizens. The task ahead for those designing and running cities in the Next Economy is to cultivate diversity and serendipity, and permanently trash the idea that everything can be designed and controlled. re: "a new public domain" and POPs as "places of consumption", this is where I think the issue of friction is helpful for me. Securitized, spaces of consumption can lack a range of experiences. Even in terms of basic interactions with homeless, panhandlers etc. Those sorts of more physical/socio/class forms of the "filter bubble" are also key. For me, in terms of urbanism, authenticity and the truly public.